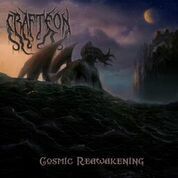 Crafteon are a band from Denver, Colorado that plays a musical style they describe as being 'bardic black metal' and this is a review of their self released 2017 album "Cosmic Reawakening" which will be released in August. Dark soundscapes along with the atmosphere of a horror movie starts off t he album before going into a very fast, raw and melodic direction which also uses a decent amount of blast beats and you can also hear all of the musical instruments that are present on the recording along with the vocals being mostly grim black metal screams. As the album progresses a couple of the tracks also brings in a small amount of acoustic guitars and at times the vocals also bring in a semi melodic tone while one song also adds in a small amount of spoken word parts and a couple of the tracks are very long and epic in length. Crafteon plays a style of black metal that is very modern and epic in the mid 90's Swedish tradition, the production sounds very professional for being a self released recording while the lyrics are based upon the writings of H.P Lovecraft. In my opinion Crafteon are a very great sounding Lovecraft influenced melodic black metal band and if you are a fan of this musical genre, you should check out this band. RECOMMENDED TRACKS INCLUDE "The Outsider" "Dagon" and "The Whispers In Darkness". 8 out of 10.